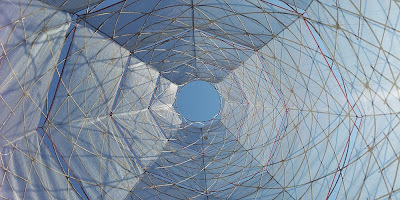 This landscape-scale sculpture designed by Italian design firm Architecture and Vision is actually a giant basket that captures water from condensation gathered on plastic mesh textile. Warkawater is named after the towering Ethiopian "warka" fig tree and stands 12m tall. It weighs only 90 kg but can collect up to 100 liters of potable drinking water a day. It is an elegant (both beautiful and simple) solution to water scarcity around the world.